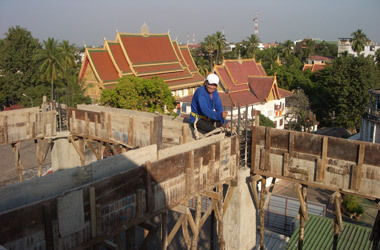 Ai La working on the 5th floor of Hôtel Khamvongsa, overlooking the Inpeng Temple. A red umbrella shading the workers preparing for a new round of concrete molding. 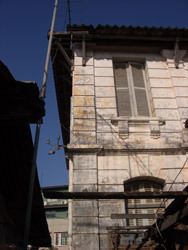 View of the Mekong River Commission building. Our favorite colonial villa on the Mekong river front in Vientiane. Hôtel Khamvongsa is named after the owner’s mother, who was one of the first Lao ladies to seize the opportunities presented by market liberalization in the early 90s. She started the Khamvongsa Guest House which was run successfully for over 10 years, enjoying a great reputation for its cheap and comfortable accommodation. In 2005, the owners decided to upgrade the guest house to a hotel. The family has a passion for construction and building and we were inspired by the beauty of both the old decaying French villas in Vientiane and the richness of Lao textiles and patterns to create the Hôtel Khamvongsa, of which we are extremely proud. 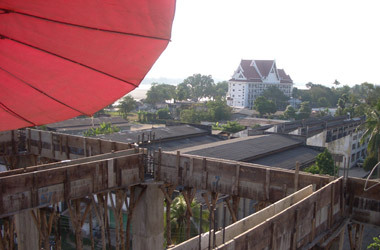 In March 2009 the hotel was ready to open its doors to the first guests just in time for the Lao New Year. During the years of construction and building we have really appreciated the valuable support and advice from family members and friends. The owners are used to welcoming friends and family to Laos and take pleasure in showing them the unique sights and captivating appeal of life in Vientiane. During your stay at Hôtel Khamvongsa, we would like to show you this same hospitality and hope that you will enjoy this charming city and its stress-free environment. We have noticed that our guests often stay longer than planned, spending their time doing ‘nothing special’, like walking or jogging along the Mekong River, strolling through the temple yards of the city centre, sampling the Lao and international cuisine in the many restaurants, drinking Beer Lao and watching the sunset at the river front, and chatting to the friendly and open Vientiane citizens. The hotel is located conveniently close to many banks, shopping centres, local markets, as well as government offices and businesses. We are also happy to offer advice or help organize your trips to other regions of Laos.